SUPPLIED WITH 12 MONTHS PARTS & LABOUR WARRANTY WITH NATIONWIDE COVER & 12 MONTHS AA BREAKDOWN COVER..... 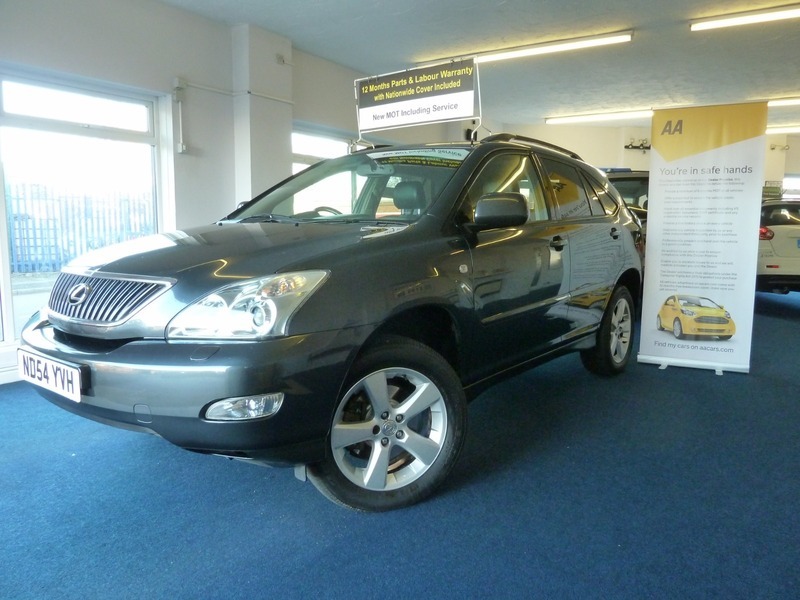 STUNNING 05 REGISTERED 54 PLATE LEXUS RX300 3.0 SE AUTOMATIC WITH TIPTRONIC OPTION 4X4. ONLY 90,700 WARRANTED MILES (AVERAGE 6400 MILES PER YEAR). NEW MOT UNTIL 22ND JANUARY 2020 (WITH NO ADVISORIES) INCLUDING SERVICE. 11 SERVICES, SERVICED BY LEXUS MAIN DEALER AT: PDI, 10411 MILES, 19688 MILES, 31131 MILES, 42743 MILES, 49806 MILES & 60014 MILES. SERVICED BY INDEPENDENT GARAGES AT: 66134 MILES & 77982 MILES. SERVICED BY TOYOTA MAIN DEALER AT: 89674 MILES. SERVICED BY OURSELVES AT: 90778 MILES WITH NEW MOT. ALLOY WHEELS FITTED WITH MATCHING BRIDGESTONE POTENZA TYRES ON FRONT & YOKOHAMA GEOLANDER TYRES ON REAR WITH MINIMUM 7MM TREAD. ONLY 3 FORMER KEEPERS WITH LAST OWNER SINCE 2014. SUPPLIED WITH 2 REMOTE KEYS, OWNERS BOOK PACK, OWNERS DVD INSTRUCTION MANUAL, RETRACTABLE REAR LOAD COVER & CARPET MATS. MULTIPLE AIRBAGS INCLUDING SIDE IMPACT AIRBAGS, STORAGE POCKETS IN REAR OF FRONT SEATS, REAR HEATER CONTROLS, REAR ARMREST WITH STORAGE & DRINKS HOLDER, ISOFIX, 60/40 SPLIT FOLDING REAR SEATS, 3X3 POINT REAR SEAT BELTS, REAR READING LIGHTS, 12V POWER SUPPLY IN BOOT, UNDERFLOOR STORAGE IN BOOT FLOOR, ELECTRIC CLOSING BOOT (CLOSE THE BOOT FROM PUSHING A BUTTON ON THE TAILGATE), REAR PRIVACY GLASS, HEADLAMP WASHERS, ROOF RAILS, FULLY COLOUR CODED. Please Note: For Further Information Please Contact Us On 01384 429630 Or 07825 137260. The Vehicle Is Supplied With A 12 Months Parts & Labour Warranty With Nationwide Coverage & Unlimited Mileage, Extendable If Required. Free 12 Months AA Breakdown Cover. Any Trial Or Inspection Welcome. Viewing By Appointment. Please Call For More Details. Open 7 Days Til Late. Part Exchange Welcome, Please Contact To Agree Value. All Vehicles Are HPI Checked. All Major Credit & Debit Cards. We Are Located 5 Minutes From The Merry Hill Shopping Centre At Cradley Heath, West Midlands, B64 7AA. 10 Minutes From Junction 2,3 & 4 Of The M5. We Can Tax Your Car Ready For Collection If Required. Please Check Our Customer Reviews And Buy With Confidence, We Have Been Selling Cars For Over 20 Years & Customer Satisfaction Is Paramount. We Can Arrange Pick Up From Cradley Heath Train Station Which Is A 20 Minute Journey From Moor Street Station, Birmingham. Delivery Can Be Arranged, Please Enquire For Price.